(C) 2014 Marc S. Appelhans. This is an open access article distributed under the terms of the Creative Commons Attribution License (CC BY 4.0), which permits unrestricted use, distribution, and reproduction in any medium, provided the original author and source are credited. Melicope balgooyi, a new species of Melicope (Rutaceae) is described. It is known only from the Austral Islands in the South Pacific (French Polynesia). However, it is not closely related to the other two species previously known from the Austral Islands, which are part of Melicope section Vitiflorae. The new species belongs to Melicope section Melicope and is most closely related to species from New Zealand, the Kermadec Islands, and the Society Islands. The new species has alternate to sub-opposite leaves, which is a very rare arrangement in Melicope and has only been described for two other species of the genus so far. In the course of phylogenetic and revisionary studies in Melicope J.R. Forst. & G. Forst., a new species was found, and along with its description, we discuss its biogeography and sectional placement. Melicope is the largest genus in Rutaceae, consisting of about 235 species divided into the four sections Lepta (Lour.) T.G. Hartley, Melicope, Pelea (A. Gray) Hook. f., and Vitiflorae T.G. Hartley (Hartley 2001). Molecular phylogenetic work (Appelhans et al. 2014a) supported Hartley’s (Hartley 1981, Hartley and Stone 1989, Hartley 2001) revisionary work in many ways, however, some of the taxa that were described at the genus level, namely Comptonella Baker f., Dutaillyea Baill., Picrella Baill., Platydesma H. Mann, and Sarcomelicope Engl., have been shown to belong in Melicope (Harbaugh et al. 2009, Appelhans et al. 2014a, 2014b). Also, Melicope section Melicope has been inferred as non-monophyletic (Appelhans et al. 2014a; Fig. 1). Melicope section Melicope sensu Hartley (2001) consists of 38 species with a distribution that ranges from India to the Society Islands in the South Pacific (Fig. 2). The section occurs on several Pacific island groups among which are the Bismarck Archipelago, the Salomon Islands, Vanuatu, Fiji, the Society Islands, Lord Howe Island, the Kermadec Islands, and New Zealand. Appelhans et al. (2014a) have found that species in section Melicope from Australia, New Guinea, and Borneo do not cluster together with the clade that contains the type species Melicope ternata J.R. Forst. & G. Forst. from New Zealand (Fig. 1). Instead, the species from Australia, New Guinea, and Borneo are the closest relatives of Melicope section Pelea (Appelhans et al. 2014a; Fig. 1). The few species from India, the Malay Peninsula, and Hainan Island (China) were not sampled by Appelhans et al. (2014a), but Hartley (2001) regarded these species as close relatives of the Bornean species. Species from the Bismarck Archipelago, the Salomon Islands, Vanuatu, and Fiji were also not sampled in the study of Appelhans et al. (2014a). Hartley (2001) regarded these species as a closely related group with affinities to species from New Guinea. According to the phylogenetic study by Appelhans et al. (2014a) and the relationships that can be inferred from Hartley’s (2001) revisionary work, the abovementioned taxa have to be excluded from Melicope section Melicope. A monophyletic section Melicope consists only of two species from New Zealand (Melicope mantellii Buchanan, Melicope simplex A. Cunn. ), one species from New Zealand and the Kermadec Islands (Melicope ternata), two species from Tahiti (Society Islands; Melicope lucida (A. Gray) A.C. 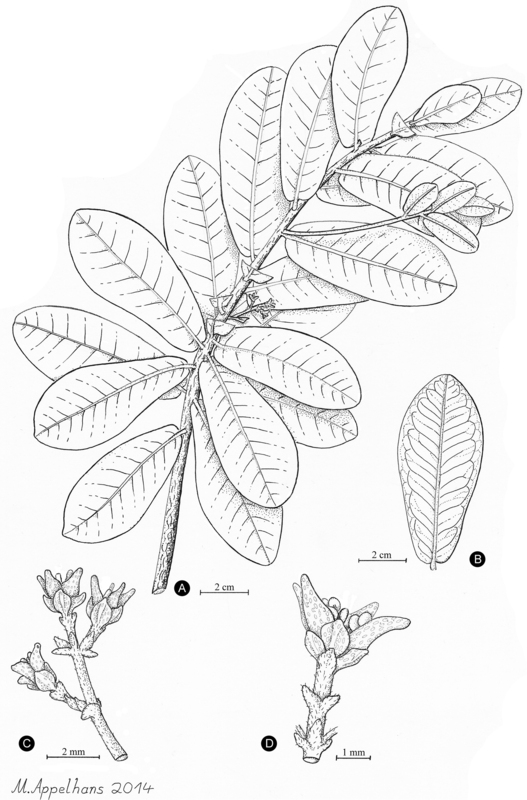 Sm., Melicope tahitiensis Nadeaud), and the new species described here. All except one of these species were sampled by Appelhans et al. (2014a) and they formed a clade together with two specimens of an undescribed species from Rapa (Rapa Iti, Austral Islands; French Polynesia). Melicope section Melicope is thus reduced from 38 to six species (Figs 1 and 2). Phylogenetic placement of the newly described Melicope balgooyi Appelhans, W.L. Wagner & K.R. Wood is based on an analysis of combined chloroplast and nuclear data (redrawn from Appelhans et al. 2014a). The clade marked with an asterisk (*) was not supported so that the placement of Acronychia J.R. Forst. & G. Forst. within or apart from Melicope is not certain. Distribution of Melicope section Melicope. A Melicope section Melicope sensu Appelhans et al. (2014a), consisting of six species including the newly circumscribed Melicope balgooyi from Rapa B Melicope section Melicope sensu Hartley (2001) consisting of 38 species. Melicope balgooyi Appelhans, W.L. Wagner & K.R. Wood, sp. nov.
AUSTRAL ISLANDS: Rapa Iti, Maii, below rim near Pokumaru, 29 Apr 2002, K.R. Wood 9727 (holotype: PTBG-041326!, isotype: NY!). This new species of Melicope differs from other species in that genus by the combination of alternate to sub-opposite leaves and oblanceolate leaves with a cordate base. Shrub 50 to 150 cm of height; plants possibly dioecious; trichomes simple, greyish-white; branches brown-red and glabrous, 2–3 mm wide at third internode. Leaves with glandular dots, alternate to sub-opposite, unifoliolate, glossy dark green above with yellow or green-white midrib, 4.5–9 × 2.3–3.8 cm, petiole 0–1 mm long, terete, glabrous; blades sub-coriaceous, glabrous on both sides, obovate to oblanceolate, margin entire, apex rounded or obtuse, base cordate; venation brochidodromous, midrib prominulous or plane on both surfaces, secondary veins and veinlet reticulation prominulous, 10–17 secondary veins per side. Inflorescences unisexual, axillary, bracteate, several-flowered, up to 1.8 cm long, axes and bracts puberulent. Flowers unisexual, tetramerous; pedicel 1.3 to 2.2 mm long; sepals ovate to rounded, pellucid-dotted, glabrous or slightly ciliolate, 1.2 to 1.5 mm long, same size in staminate and pistillate flowers; petals ovate to elliptic, cream-green, pellucid-dotted, glabrous, 2.5 to 2.8 mm long, same size in staminate and pistillate flowers; stamens 8, glabrous; gynoecium 4-carpellate, glabrous, pellucid-dotted, 2 mm long, stigma peltate, young stigma white. Fruiting carpels and seeds not known. The newly described Melicope balgooyi Appelhans, W.L. Wagner & K.R. Wood. A Flowering branch B Leaf with detailed venation C Pistillate inflorescence [peduncle not shown in full length] D Single staminate flower. Based on K.R. Wood 9727 (PTBG, A–C) and K.R. Wood 9698 (PTBG, D). (paratypes). Austral Islands. Rapa: Pokumaru summit region, upper windswept slopes of Maii, 21 Apr 2002, K.R. Wood 9698 (PTBG!, NY!). 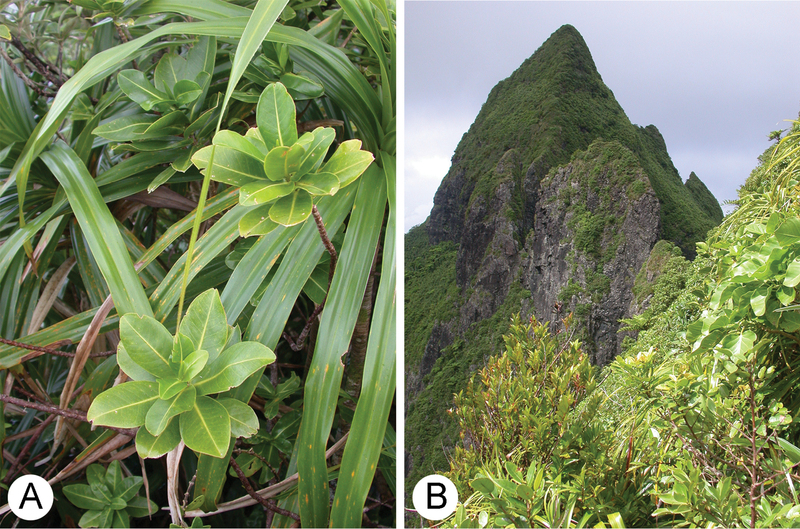 Austral Islands (French Polynesia), only known from the type locality on slopes near the summit of Mount Pokumaru on Rapa; 550-580 m.
Melicope balgooyi was discovered around the tall spire-like peak of Pokumaru (Fig. 4b) between 550 and 580 m. The habitat is characterized by a windswept shrubland and forest that runs along and below an east to west ridgeline. The plant communities around Pokumaru are unique with small relictual patches of tropical montane cloud forest (TMCF) along with adjacent wet cliffs and steep slopes dominated by Freycinetia arborea Gaudich. Tree species in the TMCF zone which are associated with Melicope balgooyi include Fitchia rapense F. Br., Meryta choristantha Harms, Oparanthus coriaceus (F. Br.) Sherff, Carokia collenettei Riley, Metrosideros collina (J.R. Forst. & G. Forst.) A. Gray, Geniostoma rapense F. Br., and Weinmannia rapensis F. Br. Shrubs, vines, and herbs include Dianella intermedia Endl. var. punctata F. Br., Astelia rapensis Skottsb., Plantago rupicola Pilg., Alyxia stellata (J.R. Forst. & G. Forst.) Roem. & Schult., Freycinetia arborea, and Hebe rapensis (F. Br.) Garnock-Jones. Dominant ferns include Sphaeropteris medullaris (G. Forst.) Bernh., Alsophila stokesii (E.D. Br.) R.M.Tryon, Blechnum attenuatum (Sw.) Mett., Blechnum orientale L., Blechnum venosum Copel., Blechnum vulcanicum (Blume) Kuhn var. rapense E.D. Br., Polystichum rapense E.D. Br., Dicranopteris linearis (Burm. F.) Underw., Belvisia dura (Copel.) Copel., Doodia media R. Br., Elaphoglossum savaiense (Baker) Diels, and Davallia solida (G. Forst.) Sw. Less than 20 individuals of Melicope balgooyi are estimated to occur around this only known site. A Habit of Melicope balgooyi Appelhans, W.L. Wagner & K.R. Wood in situ B Habitat of Melicope balgooyi around the steep precipitous slopes of Pokumaru, Rapa, Austral Islands. The species is named in honor of Dr. Max M.J. van Balgooy, a specialist of the SE Asian flora. Dr. van Balgooy has annotated the herbarium sheets of this new species stating that it is an “unusual Rutaceae near Platydesma”. Phylogenetic studies (Harbaugh et al. 2009; Appelhans et al. 2014a, 2014b) have shown that Platydesma is included within Melicope, proving Dr. van Balgooy’s assumptions to be true. In addition to Melicope maxii T.G. Hartley, which is endemic to Sulawesi (Indonesia), Melicope balgooyi is the second species of Melicope named after Dr. van Balgooy. The new species from Rapa differs from most Melicope species by its alternate to sub-opposite phyllotaxis. While most Melicope species are typically opposite-leaved, some species from all sections except Vitiflorae can have whorled leaves. This character state is most common on the Hawaiian Islands, where eight of the 52 species (incl. four species of Platydesma; Wagner et al. 1990) can have whorled leaves with mainly three to four leaves per node (up to eight leaves per node in Melicope clusiifolia (A.Gray) T.G.Hartley & B.C.Stone). Only two Melicope species are reported to have sub-opposite or alternate leaves. The New Caledonian Melicope lasioneura (Baill.) Baill. ex Guillaumin usually has opposite leaves, but can have leaves in whorls of three or an alternate phyllotaxis. Melicope rubra (Lauterb. & K. Schum.) T.G. Hartley from New Guinea and northeastern Australia has opposite or rarely sub-opposite leaves. The alternate to sub-opposite leaves of the new taxon from Rapa therefore represent a rare condition in Melicope. The placement of the new taxon in Melicope is assured by molecular phylogenetic data (Appelhans et al. 2014a), which places it close to the type Melicope ternata in Melicope section Melicope (Fig. 1). Two other species of Melicope [Melicope bracteata (Nadeaud) S.L. Welsh and Melicope margaretae (F. Br.) T.G. Hartley] have been described previously from the Austral Islands, but they are both members of Melicope section Vitiflorae (Fig. 1). Among other features, the new species differs most distinctly from Melicope bracteata and Melicope margaretae in stamen number (8) and oblanceolate leaves with a cordate base. Melicope bracteata and Melicope margaretae each have 4 stamens and usually elliptic leaves with a rounded or acute base. The new taxon is connected to its closest relatives within Melicope section Melicope by its 8 stamens. Morphologically, and also phylogenetically, the new taxon mostly resembles the Tahitian Melicope lucida and Melicope tahitiensis. The often auriculate leaf base of many specimens of Melicope lucida and Melicope tahitiensis is similar to the cordate leaf base of the new taxon. The leaf shape among the three taxa is also similar; however, Melicope lucida and Melicope tahitiensis have acuminate to acute apexes as opposed to a rounded or slightly obtuse apex in the new taxon. Leaves of Melicope lucida and Melicope tahitiensis are petiolate, while those of the new taxon are sessile or subsessile. The new species further shares unisexual flowers and peltate stigmas with Melicope lucida and Melicope tahitiensis. The holotype specimen has pistillate flowers, while the paratype has staminate flowers, indicating the species may be dioecious like its closest relatives Melicope lucida and Melicope tahitiensis. However, it is important to note that the description of the new taxon is based on only two collections with a very low number of flowers, so that a definite statement about the sexual system of the species is not possible with the data at hand. In order to differentiate between Melicope and several of its closely related genera on a morphological basis, fruit and seed characters are needed (Hartley 2001, Kubitzki et al. 2011). With fruits lacking on the only known specimens of the new taxon, its position is not absolutely confirmed from a morphological point of view. Consistent with the phylogenetic evidence, further support for the placement of the new taxon in Melicope is supported by its distribution. Out of the genera that resemble the flowering and vegetative characters of Melicope, most taxa are distributed in Australasia and Malesia (Kubitzki et al. 2011). Only the distribution of Euodia J.R. Forst. & G. Forst. reaches deep into the Pacific so that one could expect to find Euodia on the Austral Islands. However, the New Caledonian endemic Euodia tietaensis (Guillaumin) T.G. Hartley is the only Euodia species with eight stamens (like the new species) and all species that occur further eastward in the Pacific have four stamens (Hartley 2001). The Austral Islands are part of French Polynesia and are situated in the Southern Pacific. The Archipelago lies south of the Society Islands and consists of seven main islands of volcanic origin. Rapa is the second largest of these islands (i.e. 40 km2) and is about 5 million years old. The island is very rugged and is characterized by its steep central ridges, mist shrouded spires, and towering black basalt sea-cliffs. The highest peak is Mont Perau at about 650 m (Gates Clarke 1971, Clouard and Bonneville 2005, Meyer 2010). The affinities of Rapa’s flora are closely allied to New Zealand and Australia, yet with numerous exceptions. The high levels of endemic biological diversity in both the flora and fauna still puzzle many scientists because of the islands relatively small square area (Wood 2002). Concerning Rapa’s floristic relationships, van Balgooy (1971) stated “I think it best to place Rapa in the SE Polynesian Province, as an anomalous district”. More than 75 plant taxa are single island endemics to Rapa, including three endemic plant genera, namely Apostates N. S. Lander (Asteraceae) Pacifigeron Nesom (Asteraceae) and Metatrophis F. Br. (Urticaceae) (Wood 2002, 2010). Three species of Melicope occur on the Austral Islands, which are the result of two independent colonization events. The newly described species is part of section Melicope and its closest relatives stem from Tahiti, the Kermadec Islands, and New Zealand. The two other species, Melicope bracteata and Melicope margaretae, are part of section Vitiflorae with an origin probably in the area of New Caledonia, Vanuatu, and Fiji based on the distributions of their closest relatives (Hartley 2001, Appelhans et al. 2014a). The new species described here is a new record within section Melicope for the Austral Islands and an updated distribution map for the newly revised section is provided in Fig. 2. IUCN Red List Category. When evaluated using the World Conservation Union (IUCN) criteria for endangerment (IUCN 2001), Melicope balgooyi falls into the Critically Endangered (CR) category, which designates this species as facing the highest risk of extinction in the wild. Our evaluation can be summarized by the following IUCN hierarchical alphanumeric numbering system of criteria and subcriteria: B1ab(v); B2a, B2b(i–iii); D. These criteria are defined as: B1, extent of occurrence less than 100 km2; B1a, known to exist at only a single location; B1b(v) continuing decline inferred in number of mature individuals; B2, total area of occupancy less than 10 km2; B2a, one population known; B2b(i–iii), habitat continuing decline inferred; D, population estimated to number fewer than 50 individuals. Threats to Melicope balgooyi include habitat degradation and destruction by feral goats (Capra hircus L.), competition with non-native plant taxa especially Psidium cattleianum Sabine, possible landslides and fire, and the potential for inbreeding depression from small population. We would like to thank Timothy Flynn (PTBG) for providing leaf material for molecular work and a loan of specimens to GOET. Jean-Yves Meyer and Priscille Frogier of the Délégation à la Recherche, Polynésie Française, for their continued logistical support of research in French Polynesia. Timothy J. Motley (NYBG), organizer of the 2002 Rapa Expedition, and the National Geographic Society for partial funding. Steve Perlman (NTBG), Jean-Francois Butaud (Service du Développement Rural, Tahiti), Cerdan Faraire (Rapa), and Jean-Yves Meyer for field assistance. The first author would like to thank Anita Walsmit Sachs-Jansen (L) and Alice Tangerini (US) for sharing knowledge on scientific illustration. We thank María Elena Reiner-Drehwald (GOET) for scanning the line drawing. We appreciate careful editorial review by Nancy Khan (US) and we thank H.-J. Esser (M) for the helpful and constructive review of the manuscript. Hartley TG (1981) A revision of the genus Tetradium (Rutaceae). Garden’s Bulletin, Singapore 34(1): 91–131. 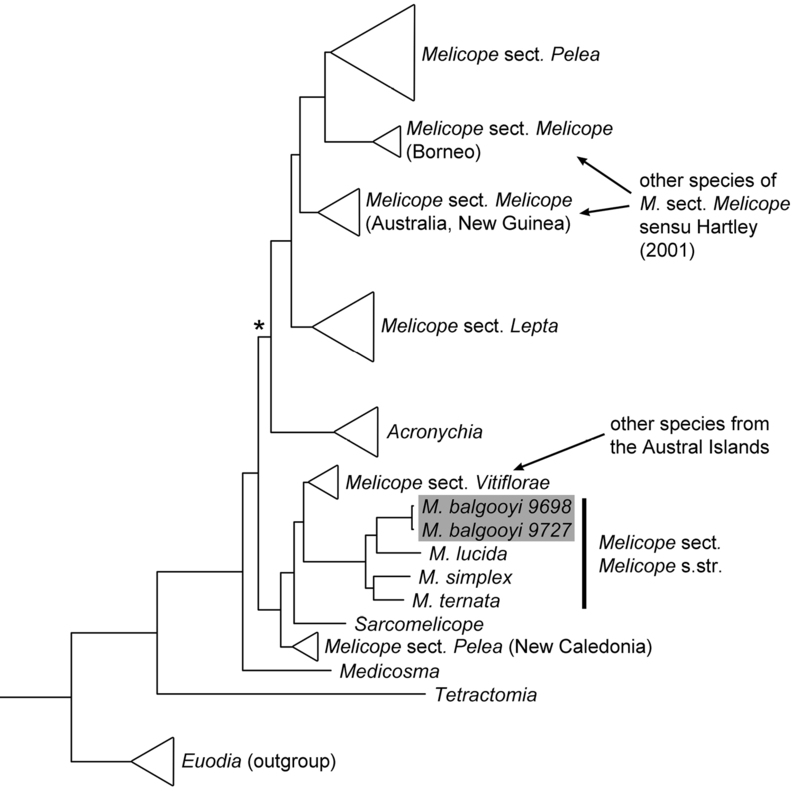 Hartley TG (2001) On the taxonomy and biogeography of Euodia and Melicope (Rutaceae). Allertonia 8(1): 1–328. IUCN (2001) IUCN Red List Categories and Criteria Version 3.1. Prepared by the IUCN Criteria Review Working Group. IUCN, Cambridge. Kubitzki K, Kallunki JA, Duretto M, Wilson PG (2011) Rutaceae. In: Kubitzki K (Ed) The families and genera of vascular plants, vol. 10. Springer Verlag, Berlin, 276–356. Meyer J-Y (2010) Montane cloud forests in remote islands of Oceania: the example of French Polynesia (South Pacific Ocean). In: Bruijnzeel LA, Scatena FN, Hamilton LS (Eds) Tropical Montane Cloud Forests: Science for Conservation and Management. Cambridge University Press, Cambridge, 121–129. van Balgooy MMJ (1971) Plant-geographical analysis of the pacific. Blumea Supplement 6: 1–122. Wagner WL, Herbst DR, Sohmer SH (1990) Manual of the flowering plants of Hawai’i. University of Hawai’i Press, Bishop Museum Press, Honolulu, 1853 pp. Wood KR (2002) Further Notes on Rapa, Austral Islands, French Polynesia. Garden Chronicles, National Tropical Botanical Garden, Kalaheo, Hawai`i, 3(2): 13–15. Wood KR (2010) Tales from the Field: Following an inner voice in search of Rapa’s rare Apostates. The Bulletin, National Tropical Botanical Garden, Kalaheo, Hawai`i, 27(2): 11–17.